A year ago today Erin and I boarded a plane, bound for home on our final flight of our 99-day journey around the world. Seems like that happened in another lifetime – so much has transpired since then. The day before we headed home, we sat down with our friend Ethan G. Salwen, who interviewed us on camera. We are grateful for that because we were able to capture our thoughts at the time – at the end of an amazing adventure. We had just finished our last story in Carlos Keen, Argentina – a town about an hour outside of Buenos Aires. It was a story about Camino Abierto, a farm, a home to adolescent boys who had nowhere to call home, and a restaurant – all filled with love. We only spent two days there but those two days came at just the right time giving us one last burst of energy to complete the project we had started over 3 months prior. At the time, I didn’t realize that it was really just the beginning of this project in so many ways. As Erin headed back to Chicago and settled back into her life, I immersed myself deeper into this project with hundreds of hours of footage that needed to be edited. I managed to get through one of the toughest winters of my life that taxed every ounce of my spirit on the darkest days. But after a round of crowd funding via Kickstarter and finding the perfect editor, Erik Freeland and many more months of post-production – we now have a film that we are proud of. As I mailed out the “rewards” yesterday to all of our backers that supported our project, I realized once again that this project is still not yet complete. There are film festivals to submit to and community screenings to line up and plans to make different “cuts” at various lengths for different markets. One idea is to break up the stories for the potential of a broadcast series. I actually went out to LA this past winter and “pitched” the idea to some industry folks and a couple of people were quite interested. I even made a new version of the trailer and renamed the show. We shall see if anything develops along those lines. I have been richly rewarded in so many ways on this journey. Getting to really know my daughter has been perhaps the biggest reward. But some of the kind comments that I have received from people who have seen the film have confirmed in my mind that this quest was meant to be. I’ll be sharing some of these comments with you in the coming months, on this blog that I have neglected as I’ve been off the radar working behind the scenes. Here’s a tidbit from our Buenos Aires Interview on the final day of our journey. I will share more soon. This project was meant to be shared – that is the only way to manifest the true power behind this thing that we put into motion so long ago. After spending the last few months intensely devoted to editing both the video and still images that were shot during our journey, I can honestly say that the “trip” was by far the easiest part of this project. who were not only making a difference in other people’s lives, but in their own lives as well. Sure, there were some tough times along the way in that round-the-world adventure, but I was living a dream. But the ultimate goal of this project was not about the travel experience. It was to create a film, using our talents to tell the stories of these extraordinary individuals in a meaningful way. We can really only express the theme of “the power of one” in creating positive change in the world, by telling the story in a global way. In the beginning of this process, the “hook” or the interest was in the trip itself, but the story is about the journey and the human spirit. It’s a daunting task to put together the pieces of a story with 150 hours of film and over 4000 images, let alone convey it in a meaningful way. I’m finally at a point where I have gotten through all the interviews and am now intertwining those individual stories and connecting them together through the words of our subjects and our imagery to communicate that universal theme. It’s no easy feat. There are days, when things seem to be going much more slowly than I’d like, and I try to remind myself that I can’t “rush” the process – that it needs to happen at its own pace. I have also found that even though we know the film will ultimately be so much stronger by working with a professional editor, that was made possible because of our success in raising funds via Kickstarter and that in itself comes with its own pressures. We have backers now and we’ve made a commitment and that is something we take very seriously. This past week I made some major break-throughs in “seeing” how this film will come together. I knew it would happen and it did as I listened carefully to what my subjects had to say. In their own way, they each had expressed, how in following their own path, they were doing what they were meant to be doing in their lives. They were being true to themselves. Last night, I was sitting in a restaurant in Argentina, surrounded by adolescent boys asking me questions in Spanish about pop culture and music in the U.S. Do you know the band Kiss? What style of music is popular there? And most importantly – what was the reaction like when Michael Jackson died? Most of the music that they listed as their favorites had its heyday in the ‘80s, and they listened with wide eyes as I tried to explain that rock and roll actually came from blues music. Sitting there at the table, I had a major flashback to when I was studying abroad in Santiago, Chile and volunteering at a public school for boys in the city. I helped teach English to 180 freshmen boys, and often I would take small groups outside of the classroom so that they could ask me questions about whatever they wanted, practice their English and hear a native English speaker talk. Most times, these conversations would center around what I just mentioned – music (they always loved ‘80s music for some reason), as well as movies, TV shows and what life is like in general in the U.S. In my blog at that time, I wrote “this also made conversation extremely exciting and entertaining for me, especially when I found kids that liked the same shows, movies and music as me.” The point was cultural sharing, and that’s exactly what I was doing with the boys at la Fundación Camino Abierto. Cultural sharing is one of the many things that Susana Esmoris and her husband Hugo Centineo encourage the boys to experience at Camino Abierto, and one of the reasons that they began to explore rural tourism on their farm. She explained how important it was for the boys to be exposed to many different things – whether it’s through the foreign visitors that come to the farm, the field trips to other parts of Argentina that the boys take every year, the many cultural programs that they offer (including an orchestra, painting and theater workshops, and dance lessons), or the cooking lessons they have with some of the most famous chefs in Argentina. The point is to provide them with opportunities and the freedom to choose their own path in life – hence the name of the place, “Camino Abierto,” which means “open path” or “open way.” It was obvious how powerful and influential these opportunities have been for many of the boys – you could see the pride in their eyes when they declared what instruments they played or when they helped in the restaurant kitchen. It was clear that some transformation had occurred and that they were happy and were doing what they loved. The whole atmosphere of the place was remarkable and infectious. The boys walk through the fields with their arms around each other, everything is fresh and wholesome, there is a sense of tranquil connection to nature, and the food is to die for. 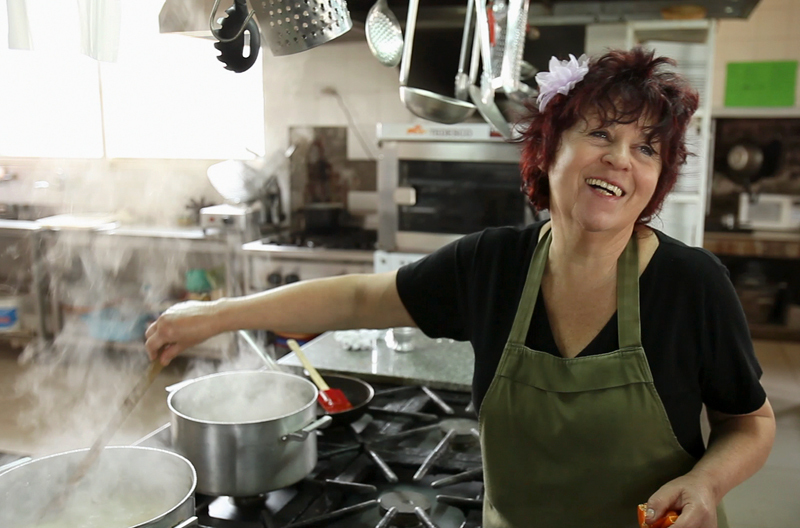 Perhaps that is because it is infused with love and happiness, which Susana describes as the continual state of the kitchen (even when there are 25 people working in it). Overall, there is an ambiance of peace, hope, and people doing what they love. Or at least that’s what I felt. I am so happy that we got to wrap up the project with this story. I am grateful that I got to spend some time with Susana, Hugo, and the boys. And I loved experiencing those priceless moments of cultural sharing. After all, isn’t that what traveling is all about? And if you must know – in the video clip that my mom posted, I’m describing to them how powerful the reaction was to Michal Jackson’s death, with people dancing in the streets and providing countless tributes to that infamous king of pop.